Qsl card from 7Q7GIA . on a radio dx-pedition,worked him on 6 bands 12 to 40 mtr. This week LA7GIA is on another hot spot from Africa. 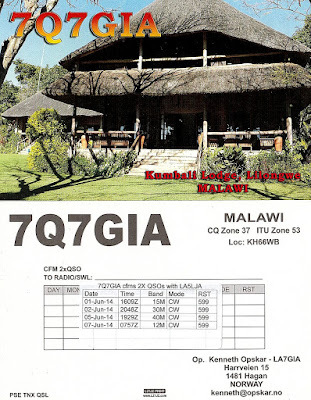 He is operating as D67GIA have worked him on 6 bands. 10-12-15-17-20-30 CW and 15-20 SSB. tx-ing, I have problem decoding you to the G4 - station.